The wp_list_comments() purpose is to display all comments (including Trackbacks & Pingbacks) for posts based on a variety of parameters including ones set in the dashboard in Settings -> Discussion panel. One functionality which is NOT part of WordPress core is the ability to separate between post comments and Pings. The two are entirely different and can be very confusing seeing them mixed together. It is much better to display Pings separately from Comments. There are many tutorials showing how to separate comments from Pings using old methods for old versions of WordPress, but I did NOT find any tutorials on how to do it when a WordPress theme is using the wp_list_comments() function. This is where this tutorial is unique to detail the solution on separating Pings from Comments. This tutorial applies to any WordPress theme that uses the wp_list_comments() function for displaying comments for a post or Page. 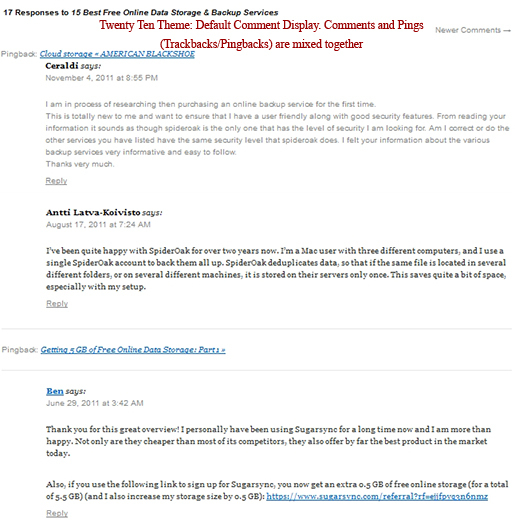 If you get many comments (including Trackbacks and Pingbacks) on your blog, then you might want to separate Pings from Comments. In this case The Comment section on your blog become better readable and presentable. Adds Two separate sections: One for Comments only and the other for Pings only. Adds Two separate Headers: One for Comments only and the other for Pings only. Adds Two separate Counters: One for Comments only and the other for Pings only. Adds Two separate Navigation: One for Comments and the other for Pings. Code is tested to work properly on WordPress Version 3.0 and higher. There is a minor issue in the code: Even though, the comment pagination count is accurate for comments and pings sections. Clicking on one navigation section also affects the other section. The 2 navigation loops are semi-independent, but not totally. But for me, this is something that I can tolerate. To give you an example. One of the popular WordPress themes is Twenty Ten. So I will be using the Twenty Ten theme as a learning and testing ground. Below is the original (unedited) code of the comments.php File of the Twenty Ten theme (Version 1.3). Note: To scroll within the code, you can also click on the code window and use your keyboard´s arrow keys. For the purpose of this tutorial, the most important statement is line 54 of the code. The wp_list_comments() function works on WordPress 2.7 and above. But I hope you will always upgrade to the latest version. 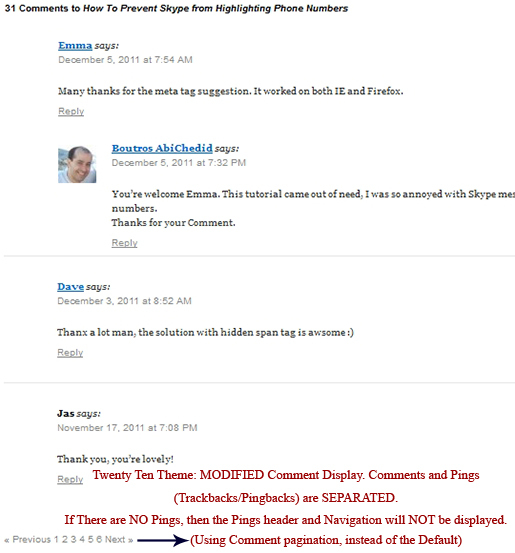 WordPress Twenty Eleven theme (Vers 1.3) also uses the same wp_list_comments() function. More on that later. The image below, shows how the Comments section for this Blog looks like when I use the Twenty Ten theme without any modifications to the Comment Template (default comments.php file). Notice how Pings and Comments are mixed together. How can I Separate Pings from Comments in Twenty Ten Theme? STEP 1: You need to replace the Original/Default comments.php file above with the modified code below. Save it and upload it to your server. * Comments from Pings (Trackbacks and Pingbacks). * Twenty Ten Theme. The template for displaying Comments. //comments_only_count() is a custom function that must be added to 'functions.php' file. //It is important that the wp_list_comments is placed before the comment navigation (if it exists). //Otherwise, the comment navigation/pagination will be wrong. //section. Second reson if there are no Pings, then why display the header. //get_pings_pages_count() is a custom function that must be added to 'functions.php' file. STEP 2: Open functions.php file located in your theme´s folder, and add (copy and paste) the following CODE-X. Save it and upload it to the server. CODE-X is needed so that Pings are counted separately from Comments. WordPress has only the get_comments_number() template tag that retrieves the value of the total count of comments, Trackbacks, and Pingbacks for a post. * @Description: FUNCTION-1: returns only the number of comments. * I wrote my own function, because the default "get_comments_number()"
* counts all comments including pings. //Filter the comments count in the front-end. //When in the WP-admin back end, do NOT filter comments (and pings) count. To separate Comments from Pings you must use both CODE-TT-M as your new comments.php file AND you must add CODE-X to your theme´s functions.php file. Keep a backup copy of orginal comments.php file, in case you want to revert back. The image below shows how the modified Comment section looks after implementing CODE-TT-M AND CODE-X. Notice How the Comments are Now separated from Pings. I want to Paginate Comments. What Should I do? The default wordPress Twenty Ten theme uses only the « Older Comments and/or Newer Comments » links to break comments into pages. You still need CSS to style the Comments/Pings numbered links. You will need to set up the options in the WordPress dashboard (Settings -> Discussion) for paging to work. Check a Previous tutorial that helps you with this: How To Add WordPress Comment Pagination Without a Plugin. 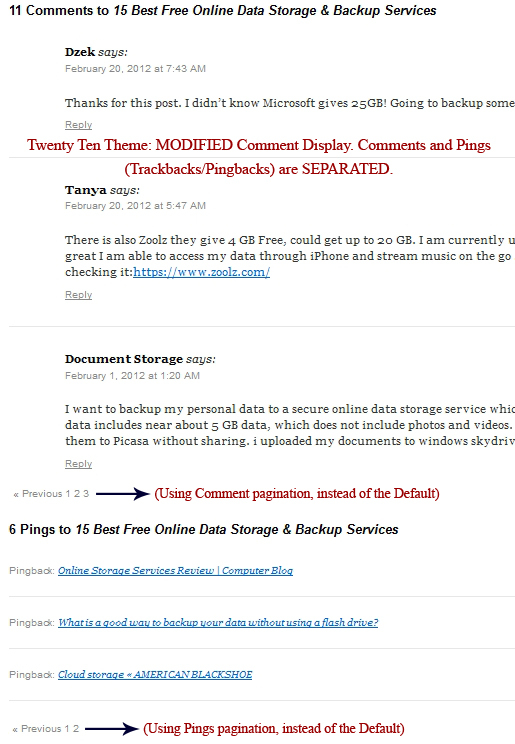 Where To Enable Paged Comments in WordPress? To enable Paged Comments, or the default comment navigation for your WordPress blog, Login to your WordPress dashboard. On the Left Panel of your Administration Screens, go to Settings -> Discussion as shown in the image below. I am Using WordPress Twenty Eleven Theme. Can you Help me With That? The template for displaying Comments for WordPress Twenty Eleven Theme (Version 1.3) is similar to Twenty Ten, you can follow the same procedure in this tutorial with probably some minor tweaking, and you should be all set. If you want me to help you with separating Comments from Pings, then a donation would be greatly appreciated. Now you know what to do if you want to Separate Comments From Trackbacks/Pingbacks from the wp_list_comments() output. This tutorial applies to any WordPress theme that uses the wp_list_comments() function to display comments. If you have something to add or anything else to say, please share your opinion or questions in the comments section. Your opinion matters, unless it is a Spam. Thanks a ton, bud. I needed this. I’m running into a little issue, though. Your code is perfectly fine but I’m having trouble figuring out how to make some adjustments to do what I need done. Right now, I’m using comments_number() on my blog feed to show the total number of “responses” in the byline. Then, on the single posts, I am using your wonderful code to separate my comments from my pings beneath the article content. Well, I want to keep the number of “responses” in the byline on the single posts. However, the theme I have built has an option to hide the pings beneath the article. So, if they choose to do so, only the comments will show… which is fine. But now it “looks” like there’s an error because the comment count beneath the article will not match the the number of “responses” in the byline (which, remember, uses comment_number()). Do you know of a way to use your code in the byline? When the user chooses to hide pings, I’m trying to write a conditional that will subtract the number of pings (just like in your code) from the number of “responses” in the byline. That way everything always matches. As of now, I simply show “responses” on the blog feed in the byline and I hide it on the single posts. Any help would be appreciated. Your code plus this little gem got me what I needed! Hello I’m Ronald. Your article is great. Thank you very much. I’ve been looking for ways to separate the list of comments and pingback for a long time. Finally I get the trick here. For a long time I was struggling with pingbacks and comment. 57 queries in 0.360 seconds.